At BJU, you’ll study the theatre not merely for the sake of art, but for the sake of God’s glory. You’ll learn of the great need for communication characterized both by artistic excellence and timeless truths. As an artist, you’ll imitate God’s role as creator as you unveil stories of truth and beauty that point your audience to the fulfillment of all beauty and truth—Jesus Christ. You’ll study the power of drama to plant seeds of biblical truth in people’s hearts. And more than that, you’ll develop biblical discernment and the skills to find and produce pieces that are appropriate for your audience. At BJU, the theatre program is about more than classroom knowledge; it’s about hands-on experience in theatre. You’ll build a solid foundation in the essentials of theatre, including acting and stagecraft, and you’ll get involved in student productions and official BJU productions. In addition, you’ll have opportunities every year to get involved in special events like the bake-off, a competition in which you have only 24 hours to practice and perform original student-written plays. For your capstone experience you’ll play a part in staging an actual production for an audience. Together with your peers you’ll submit plans for an original play, adaptation or published drama. You’ll also work closely with a faculty member and receive guidance throughout your play’s production. Your teamwork will allow you to soar to greater heights in a short period of time as you produce your work. Recent productions have included Agatha Christie’s And Then There Were None and Frank Capra’s It’s a Wonderful Life. You’ll complement your theatre classes with the BJU Core. English, history, economics, philosophy and other subjects will broaden your horizons and help you relate to more diverse audiences. Liberal arts also develop essential life skills—critical thinking, problem-solving, creativity and effective communication—that will help you adapt to any situation. In the Theatre program at BJU there are electives in the many aspects of the field. If you enjoy writing, you can develop your own scripts, from monologues to one-acts to full-length plays. For actors you can increase your sensitivity and imagination through improvisation, theatre games, scene work and vocal and physical exercises. Rehearsing scenes with your fellow acting students will stretch you as a performer and help you to act and react as a believable character in dramatic circumstances. If backstage work interests you, you can familiarize yourself with every behind-the-scenes aspect of drama with classes in lighting, costume design, scene design and directing. As a student, I got to do practically every behind-the-scenes job in theatre there is and got plenty of chances to practice techniques learned from classes. That was probably one of the best preparations I could have had for what I do now. I don’t think there was a semester that I wasn’t involved in something, but it wasn’t just about being busy or having fun (though that goes along with it). It was having the chance to learn and make mistakes in an environment where that was the point. I more carefully defined my philosophies as a Christian artist during my master’s degree, and now, as a teacher, that’s my goal for my students (also the point). The point for all of us: that Christ is made manifest through the Christian artist. College Theatre Professor, Dunbar, Wis.
Tech Theatre Teacher and Costume Designer, Tampa, Fla.
Arts Management, New York, N.Y. Both onstage and behind-the-scenes opportunities abound at BJU. Every semester, you’ll have the chance to participate in the biannual Shakespearean productions that are a part of the Concert, Opera & Drama Series. You’ll also have numerous opportunities to collaborate with fellow theatre majors on student-run productions, similar to the recent productions of Our Town and Sherlock Holmes. At BJU, you’ll have more opportunities for real-life experience in theatre than you know what to do with. Biannual Shakespeare productions: Nearly every semester students can get involved in the Shakespeare production. There are usually many acting roles open to students, including understudy positions for the lead roles so you can learn from your faculty members on the job. Living Gallery: A team of talented artists and technicians spends hundreds of hours putting together the sets, costumes, makeup and lighting needed to create larger-than-life artwork. In addition, an original drama ties in contemporary spiritual struggles to the overarching theme of the artwork. Your faculty bring to their classes many years of teaching experience as well as experience in the theatre and communication fields. Many of them are heavily involved in BJU’s operas, plays and other productions. They’ll give you plenty of feedback so you can get an honest appraisal of your work to help you achieve your greatest potential. Analyze and assess historical conventions, theories and existing dramatic text. 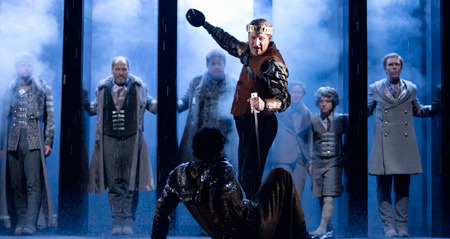 Create works of theatre within a collaborative environment. Recognize and articulate a biblical worldview as it applies to theatre.